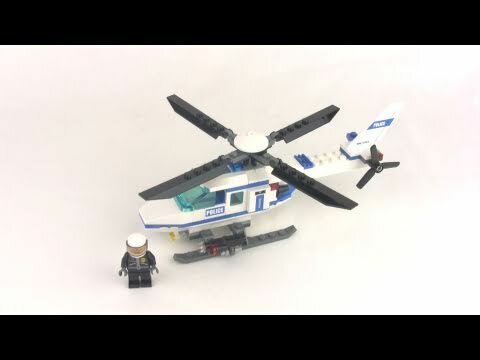 Here's a little Police set review for ya! 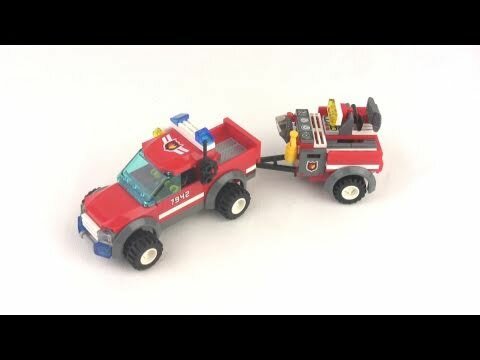 A build and review of a cool little LEGO City fire set! 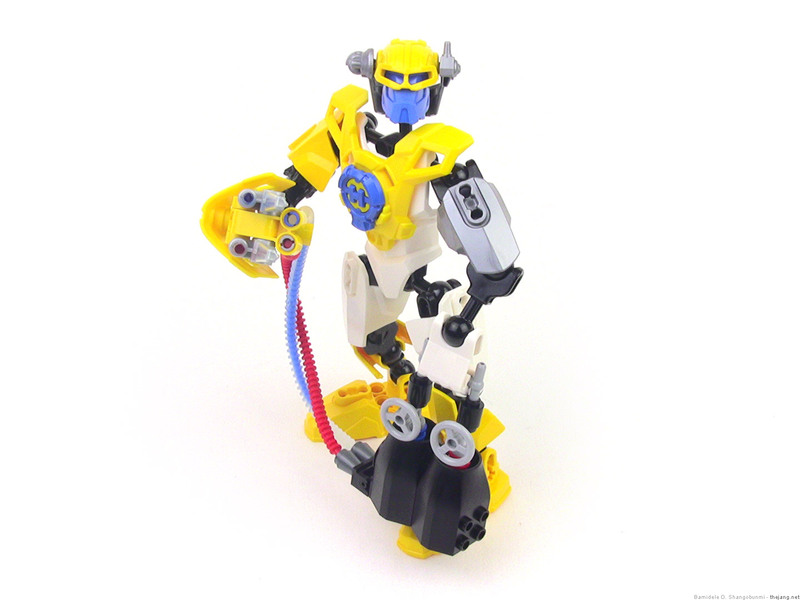 Introducing Ruze 2.0, a member of the Hero Factory Omega Team rookie class. Unlike other rookies we've seen to date, Ruze has fully completed his Hero training. Why hasn't he been awarded full Omega Team membership yet, you ask? The Hero Factory experimental technology labs recruited him quite late in his training cycle and they repeatedly extended his enrollment in the testing program, against his wishes. Out of patience and eager to prove himself worthy for field duty once & for all, Ruze recently seized an opportunity and took a foolish risk. He was assigned to test new cloaking armor, and he used this to sneak into the lab during off-hours. Well, actually he didn't sneak in, he just cloaked while he was inside, and didn't leave, while everyone else did. Before he took off, he picked up a powerful antigravity-fortified extraction arm being developed to aid with rescue missions. Unfortunately for Ruze, the antigrav fields, though mostly contained within the device, counteracted some of the effect of the cloaking armor, leaving one arm and part of his leg mostly visible. 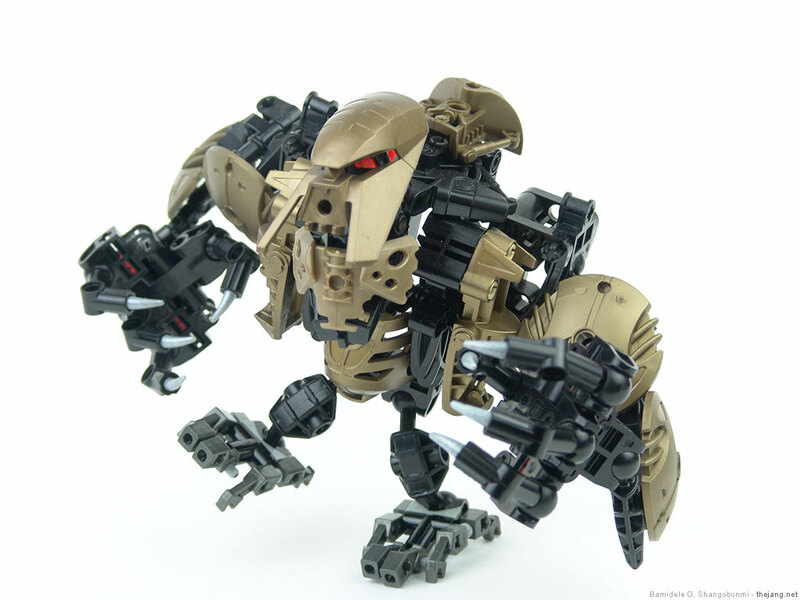 Committed to his plan, Ruze fled Makuhero city under cover of darkness, escaping detection by keeping his visible portion in the shadows and close to walls. Ruze has refused to give any details, but he managed to sneak into Fire Lord's personal hideout, presumably using the extraction arm to blaze an under-defended route (ventillation shafts, perhaps?). 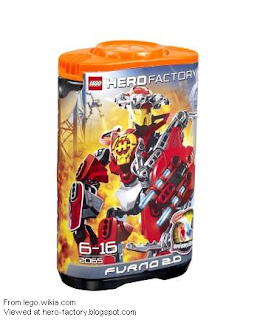 There, he managed to "acquire" a piece of Fire Lord's own lava armor, and he made it back to the Hero Factory, in one piece! 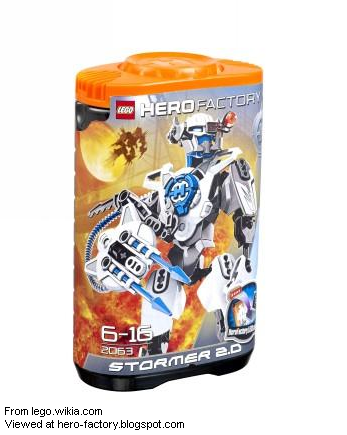 Ruze faces much commendation, as well as much disciplinary action for his many violations of Hero Factory safety protocols and his standing orders. Regardless, the Hero Factory labs now have an invaluable sample of their greatest enemy's technology. Hopefully they'll be able to discover a weakness they can exploit, before Fire Lord's team completely cuts off all vital supply lines to Makuhero City! Trivia: "Ruze" is both a pun on the word "ruse," referring to his cloaking armor, and also a derivative of "ruz," the Breton word for "red." Lego Hero Factory 2011 SUMMER set preview! 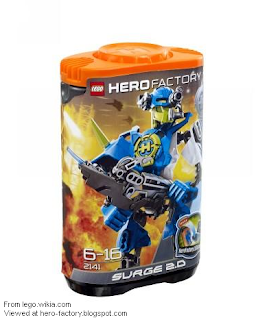 "Savage Planet"
Blaziken1110 on YouTube kindly alerted me to the appearance of Summer 2011 Hero Factory set pictures on Flickr. The new series is called Savage Planet. Update: Pictures cannot be posted at this time. 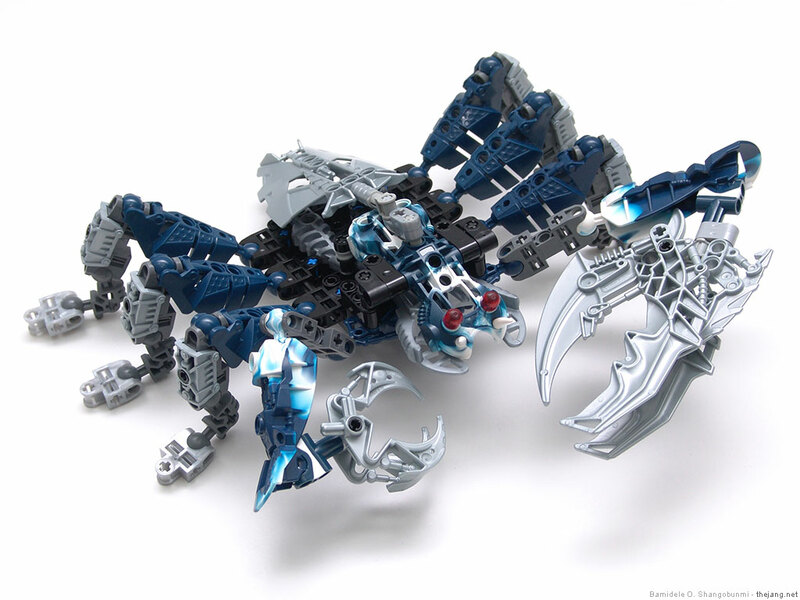 Leaked photos of the Summer sets are confidential property of The Lego Group and distributing them is a criminal offense. The new unifying theme, replacing fire & fire-fighting, is the jungle, and possibly some "black magic"
Heroes have already lost their controversial 3-piece generic 2.0 head design, and unique masks are back. Likely the newer main head piece remains, but the visor insert part is left out and the masks cover the faces. Each hero has a single green armor piece. 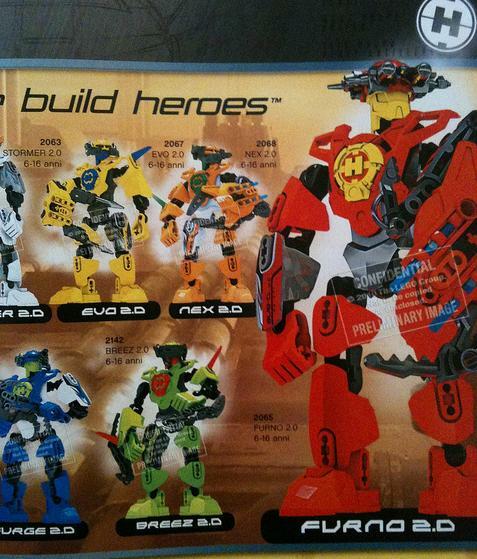 Presumably these will be able to be used to form an upgraded combiner model, Stars Tahu-style. 2143 Rocka 3.0 - This appears to be the new star of the show, replacing Furno in the limelight. His mask is huge and he gains a titan version, which I'll talk about in a second. In the grainy pictures he looks like he almost has a squid-shaped head, shades of Mon Calamari. He appears to have a melee weapon with two large blades and one small one for cutting through the underbrush of the jungle. Update 1/8/2011: Rocka's mask is in the form of a giant lion head. 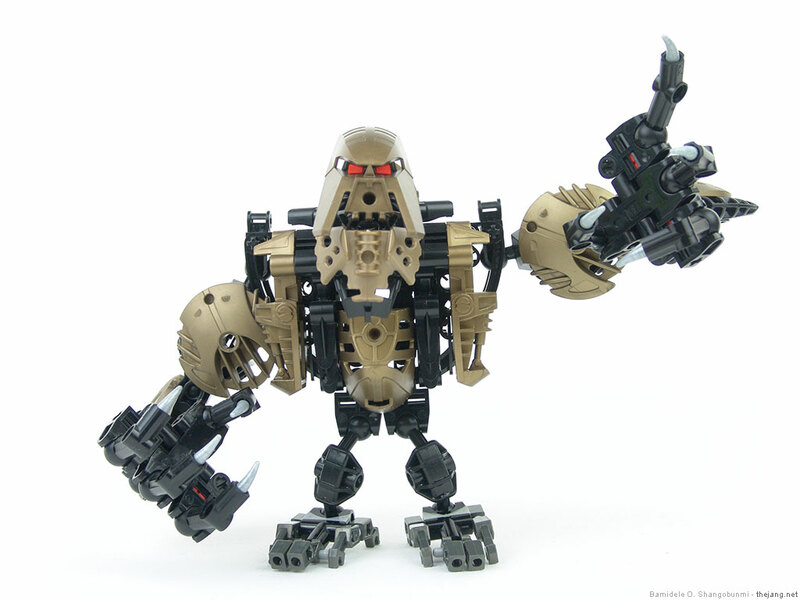 2282 Rocka XL - Could this be the first titan-sized hero in the Hero Factory series, Takanuva-style? Or does he turn to the side of evil in the storyline? In the background on his box you see hero heads on stakes! The head sure does look mean, too! 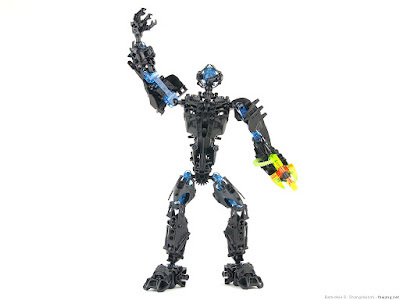 The legs appear to use a modified form of the basic design used on Fire Lord (booooo). 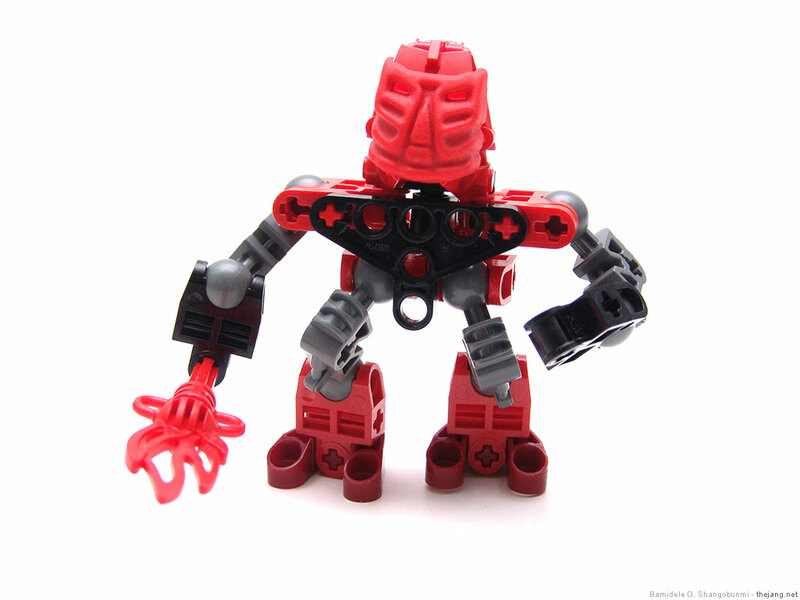 2144 Nex 3.0 - Nex's head has progressed into a more swoopy design with a bit of a Bionicle Stars Gresh flavor, minus straight extensions off the back of the head. 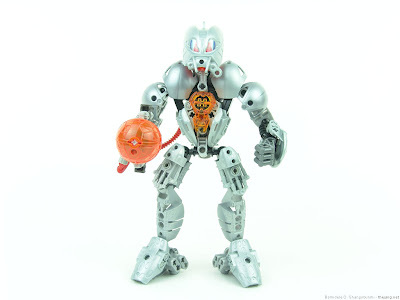 His weapon appears to be very similar to Rocka's. 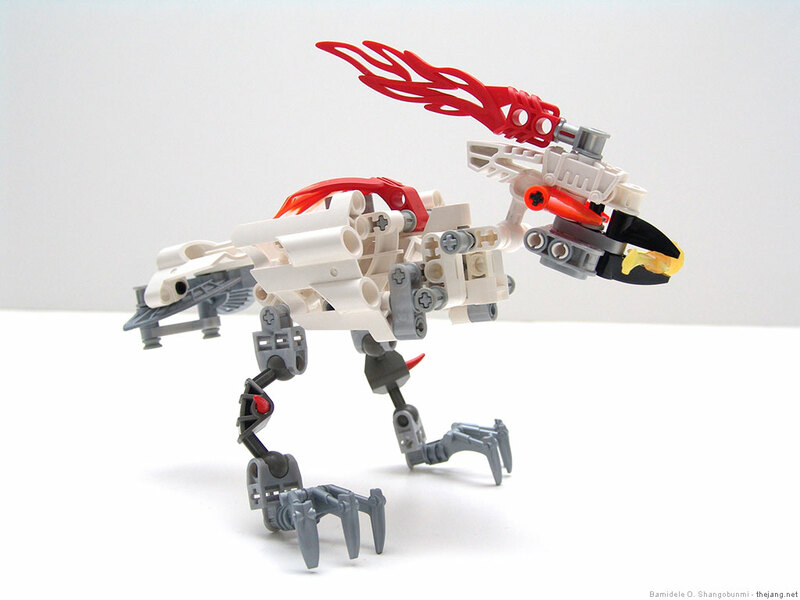 Update 1/8/2011: The inspiration appears to be from a saber-toothed tiger. 2145 Stormer 3.0 - The Alpha Team leader is back again with a face shaped a bit like that of Vastus, inspired by the same basic shape that classic Lego medieval knight minifigures have used since the 80's. There is some articulation available in the weapon, but it's difficult to see how the weapon will work. Update 1/8/2011: Stormer 3.0's mask appears to be a cross between a rhino and an Aztec warrior helmet. 2182 Bulk 3.0 - Rumors of Bulk's demise have evidently been greatly exaggerated! He's back and has an alien-looking face in the mask. He's thinner & lighter than before, contrary to his name. He uses dual weapons that are attached to his forearms. Update 1/8/2011: Bulk's new helmet seems to mimick a stylized jackal head. 2183 Stringer 3.0 - Another surprising return! Stringer is back with a fairly recognizable face, but he now has more orange than ever, using a bright orange main armor piece, right arm armor spike, and weapon tines/blades. Update 1/8/2011: His mask seems to be inspired by a black bear. 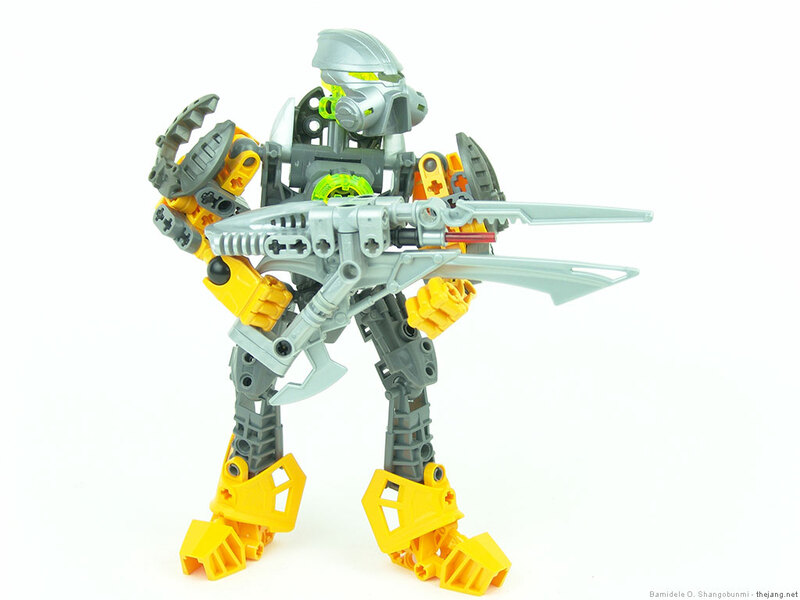 2191 Furno 3.0 - Presumably no longer a rookie, Furno is on the team with a single blade weapon, a new upper arm armor piece that appears to have very small wings (or are they blades?). His mask may be inspired by a falcon's head. 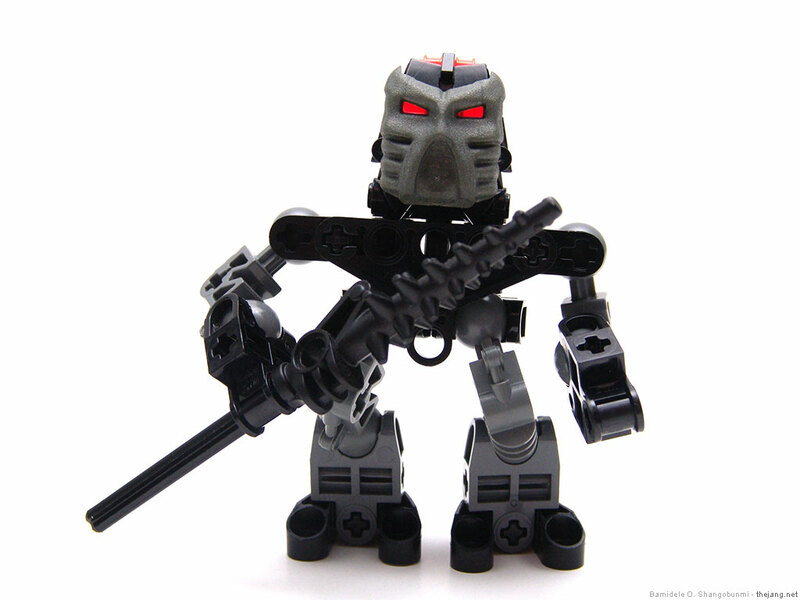 2283 Witch Doctor - This is the new main villain, who likely remotely controls & powers the others with his spikey staff. 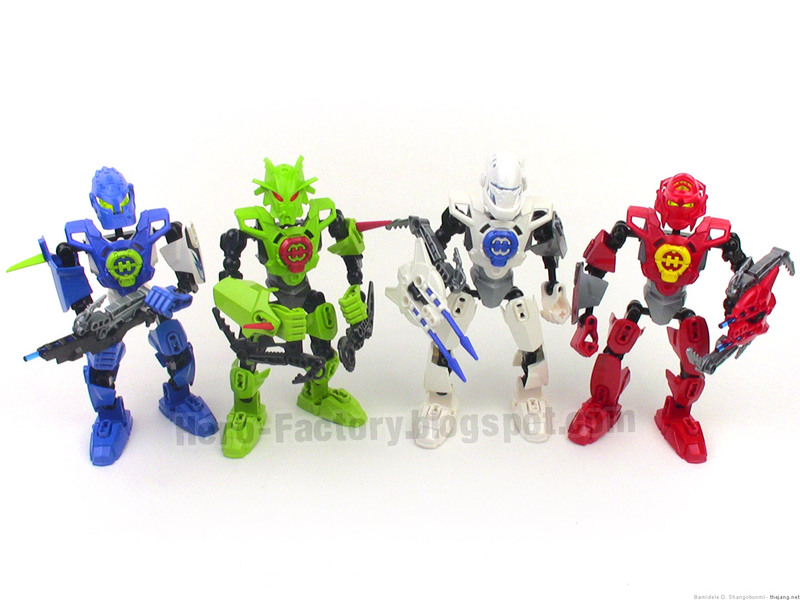 Looks like a few Ben 10 tail pieces have made it into this set. 2231 Waspix - Okay, I thought Jetbug looked a lot like Bitil. This guy is closer still, by far. 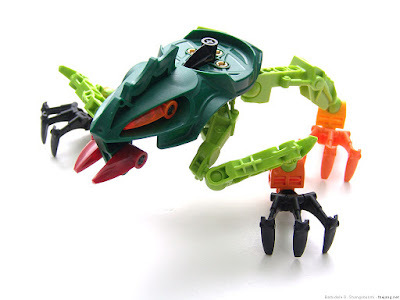 His four hands are from the Ben 10 series. 2232 Raw-Jaw - A stout four-legged creature I'm really looking forward to seeing more of. 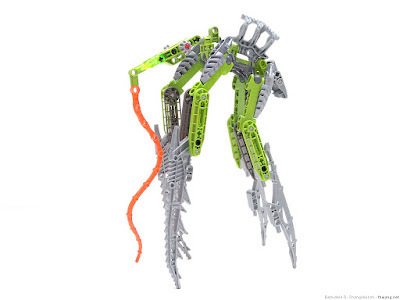 I see four of the Exo-Force robot arms (same as the Maxilos fingers) used as articulated upper teeth in what looks to be an extended right front leg that doubles as a jaw. 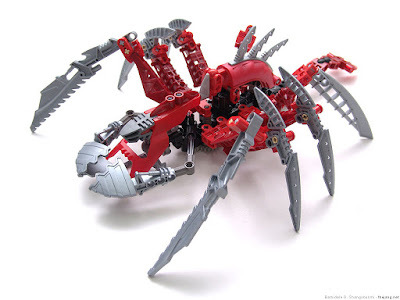 He also appears to use hero armor pieces on each of those front legs. I may be looking at the picture wrongly, but I think the head is relatively small and in the center of the image with two red upper teeth. 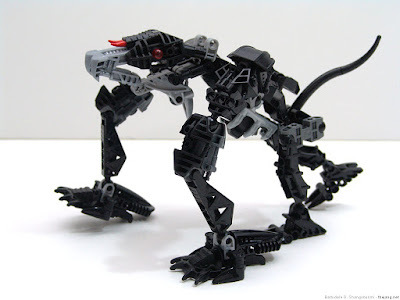 You can see a new armor six-scaled add-on piece used here, in black, on the front legs and also the tail. 2233 Fangz - Another four-legged creature, this one with three spines on his back, likely poison-tipped. Three-toed large claws make a return in the silver-toed variety again, and we appear to be getting a silver-tipped version of the two-toe Zesk claw. 2236 Scorpio - Not Skopio, this is Scorpio, like the zodiac sign. 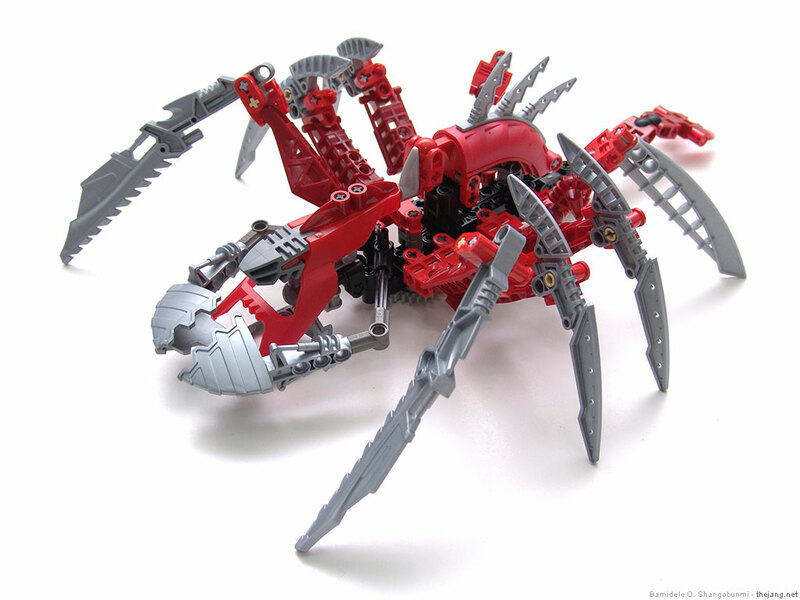 This is quite a large set with what looks like four main legs, two shorter front legs/arms with Ben 10 claw hands, and a long articulated stinger tail with a Zamor sphere launcher that shoots what they'll probably call a "poison sphere." 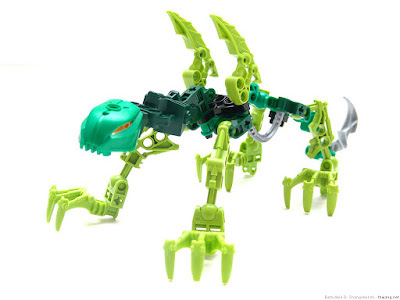 I hate to keep talking about Bitil, but the head on this guy looks a lot like Bitil's, at least in the design of the mandibles. This set also makes use of a handful of the six-scale armor add-on pieces, this time in bright green. The series grows this Summer, expanding from 10 figures to 12. That's always good thing, as more unique sets means more parts choices! From the preliminary pictures I like all of the soldier-class villains, but then again, I've always been a big rahi fan. The Witch Doctor concept doesn't amuse me. It can be considered borderline offensive with connotations of negative stereotypes of pre-modern cultures. 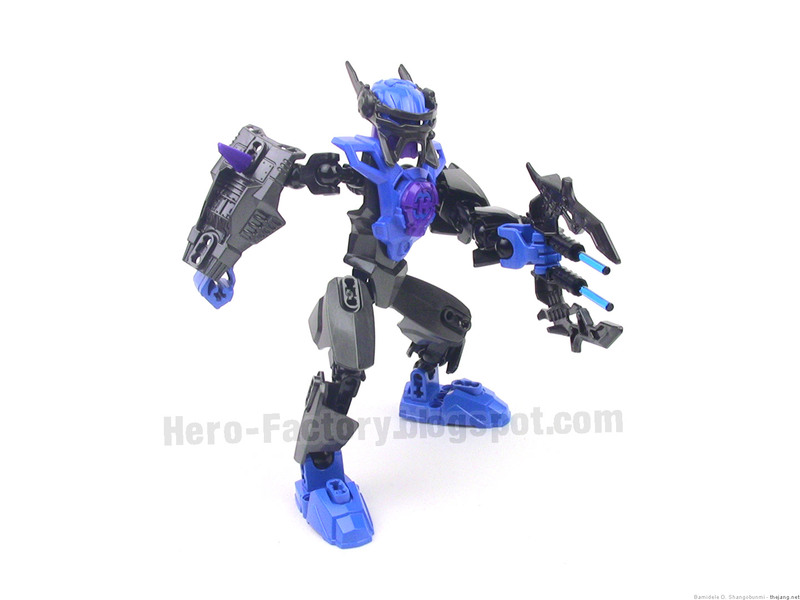 As a set, though, he looks pretty cool, a bit better thought-out and more cohesive than Fire Lord before him. The new heroes are a bit of a mixed bag for me. I welcome the return to full masks, though I don't like those of Rocka or Furno. Bulk is my favorite so far. The overall hero bodies appear to remain the same in general design from the 2.0 series, but the use of green for the unique armor piece really bugs me. I get the general idea -- green, for jungle. However, the color clashes violently with every single character's theme. I'm anxious to learn the story of Rocka XL. I would really be happy if he becomes a bad guy. For one thing, it's good to put twists into storylines. Secondly, he looks absolutely ugly, and I would like to see his head get crushed. Hopefully we'll get some higher-resolution photos soon! Thanks again to Blaziken1110 for the scoop! This is Redox 2.0 from the rookie crew on the Lego Hero Factory Beta Team. While rookies are going through training, they are always given non-combat field tasks to help build discipline and to also help them to integrate with the general populus in their assigned area, and to learn about local personalities and cultural nuances that are difficult to program into digital memory. Redox 2.0's main job is to assist with repairs to structures damaged by villains that have been pursued and/or subdued by Hero Factory teams. He carries a pair of supercompressed chemical canisters that feed adjustable nozzles with fine pattern & flow control. When the two chemicals hit a surface and combine, they harden into a sort of metallic concrete that equals or exceeds the durability & weight rating of the original material that's being replaced. With this method, walls can be rebuilt and roofs patched in just hours. Drone robots are then used for the relatively thoughtless jobs of sanding & repainting the surface. I look forward to seeing Redox complete his training in due course and take his place as a frontline member of the Hero Factory Beta Team in the future! I've seen a few people ask what the 2011, "2.0" series Hero Factory heroes would look like with 2010 "1.0" series heads & masks, so here they are in all of their glory. I like the look a lot. The height of the head off the torso isn't perfect, but I think these aesthetically look much better than the official 2.0 setups. Especially Furno of course :) However, there's a lot less customization that can be done with this style for a given number of parts, so it's a trade-off. I really hope Lego will release some generic visor/accessory sets to support MOC-making in the new series. 22 comments - Post a response! In addition, I did one recap video covering my thoughts on all of the villains together. Don't watch this without watching the actual reviews -- this is not a substitute for them. There has been more buzz about Evo 2.0 than the other 2011 Hero Factory heroes simply because of his color scheme. More specifically, it's the inclusion of purple that got much of the Hero Factory fanosphere all giddy. Oddly enough, there are only 3 purple pieces in the set, namely the base of the head, the hero core, and one small rubbery spike. I guess we're just easily excited. Other than that, Evo is about the same as any other hero in the series. Same construction, same posability, same playability. I think the figure looks pretty good, myself! 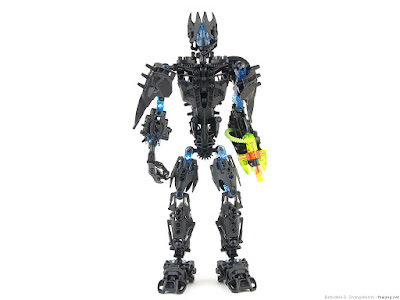 Out of all of the new Hero Factory villains, Nitroblast has the most consistent visual appeal from all angles, in my opinion. 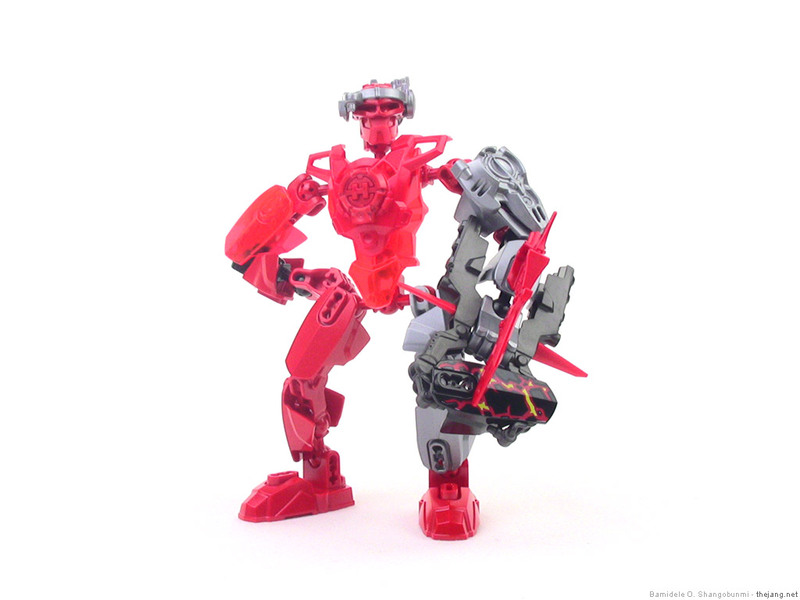 To my surprise, the use of a red main body skeleton in conjunction with the red legs, upper arms, and mask, allow for a more finished appearance from behind than the other villains (and heroes, too). The mask is the whole head on this one, attaching directly to a socket joint piece, but I think that's well-executed and doesn't detract at all from the appearance of the piece. I have a mild obsession with his eye piece, a Baraki eye in what I believe is a new color for that mold, sort of a radioactive green -- I don't know the official name for the color, but it's not a normal trans-green, nor is it traditional neon green (which is actually more of a yellow). Whatever it is, it's mesmerizing and I want lots of them. The sole miss with this figure is the left arm, which I think is over-engineered and much too stiff for its own good. The jet-powered flame thrower isn't heavy enough to warrant this much friction in the joints. The LEGO Hero Factory website shows that the inner arm piece should to be detatched when needed, and the open socket joint is supposed to represent a "plasma blowtorch." The instructions, though, have you assembling it to the main arm, and in this position it fits well and obviously was designed to be assembled together. The box art also shows it fully assembled. 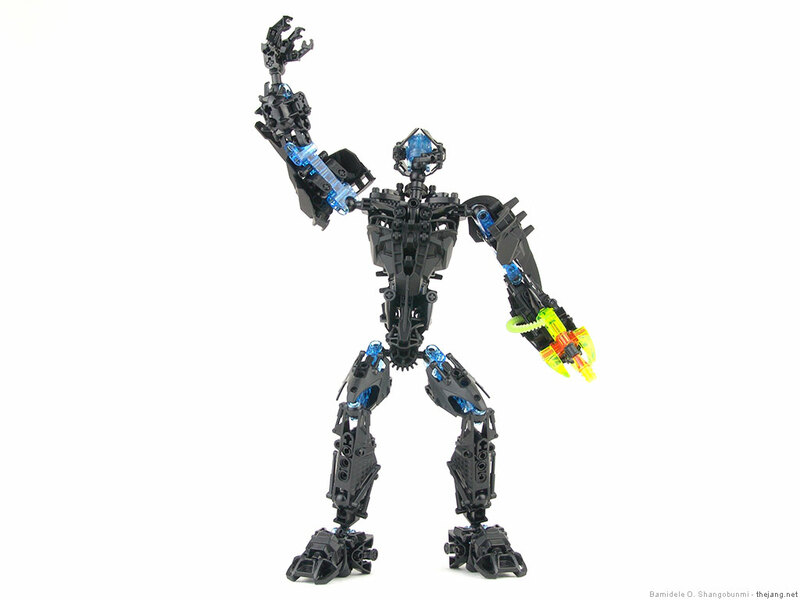 I get the feeling LEGO realized the arm was too stiff and tried to rationalize it after the fact. When it's separated as shown on the site, it looks completely unfinished and silly. "Plasma blowtorch?" Please. 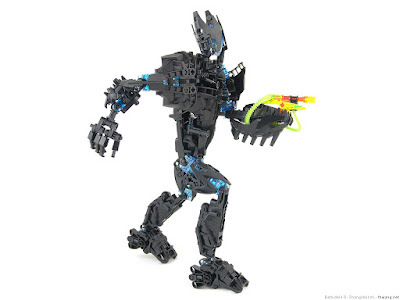 Other than the arm, though, great set, and a cool look with some very exciting new pieces! I think Breeze 2.0 looks great from top to bottom, and I'm glad she maintains use of dual boomerang-style weapons, making her the only 2.0 series hero to dual-wield. The continuation of the use of medium red as an accent color against the fluorescent green main color is brave, as it's easy for those the colors to clash on their own merits, but I think they work out perfectly with this figure. I also like Breez's swoopy visor set, but I fear that the new face has lost any semblance of femininity. It's good to have a female character in the line, and it's great that she's 100% the equal of the males, but make her look like a girl. There are plenty of female Lego fans who appreciate having a character to really be able to identify with. 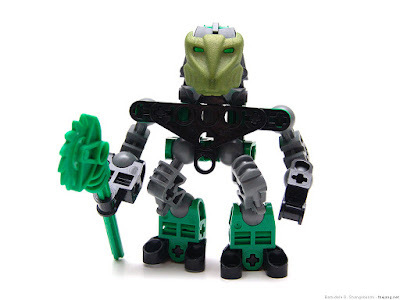 We had that in many of the Bionicle series, and the original Breez definitely had feminine facial features. Maybe there will be a Breez 2.5? Regardless, this is still a cool figure with great display value and lots of playability. It's a little tough to switch over to the new 2.0 style if you were really getting into the original 2010 Hero Factory sets. Putting prejudice aside, though, this is a pretty cool figure, though his binoculars are a little dorky. 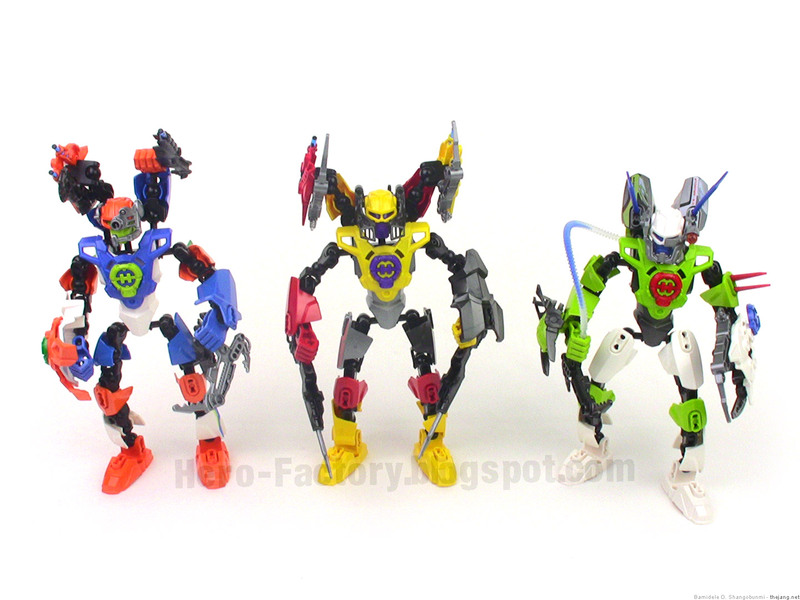 The color scheme is good and all of the joints have plenty of flexibility. I think the core piece used in the weapon gets stale after you see it used in more than one set, so hopefully there won't be any more reuse of that part. Standing amongst the rest of the 2011 Hero Factory heroes, Furno 2.0 looks right at home, but just individualistic enough to not blend in too much. Drilldozer has a relatively plain look with a larger percentage of flat areas of solid color than the other villains. He looks a little more like the heroes in this way. He's 100% evil, though. 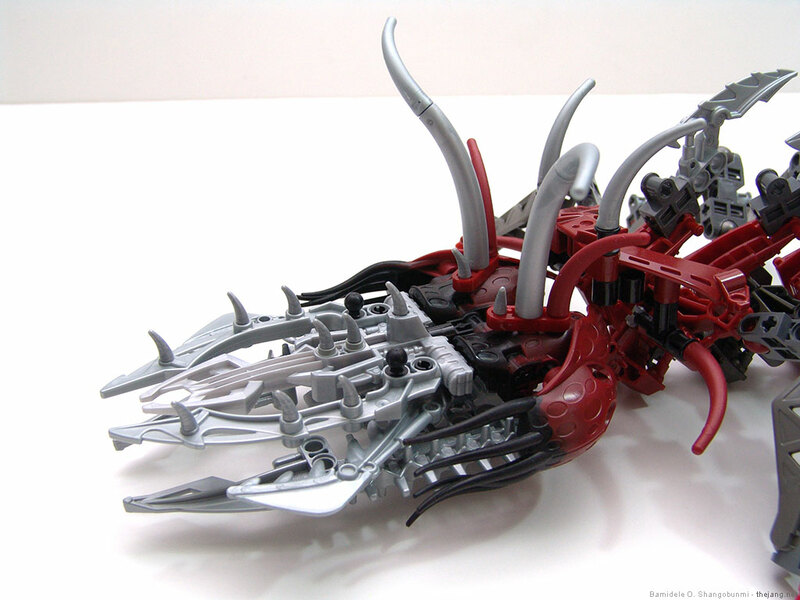 I like the flexibility & posability of this set, and the way the drill bit spins freely is a nice touch. Lots of playability with this set with the combination of that drill on one side plus a melee weapon on the other, plus a ranged weapon, to boot. He can do everything but fly. The only thing I don't like about this figure is the Fire Lord face on the back of his head. It contrasts from the rest of the figure too much and it's incredibly obvious when you're looking at him from any rearward angle. 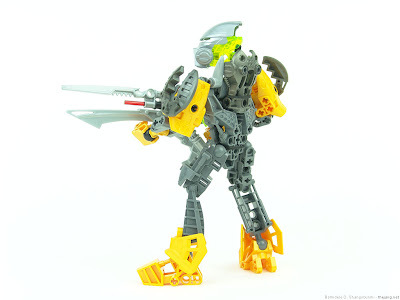 He's also a bit on the short side, but the number of parts is similar to Jetbug and Nitroblast. In all, a fun figure to build, and very versatile. Surge 2.0 becomes a far less unique character this year (as do the others). All of the heroes have great articulation in the underlying skeleton, and the armor is designed to not bind up or block motion. 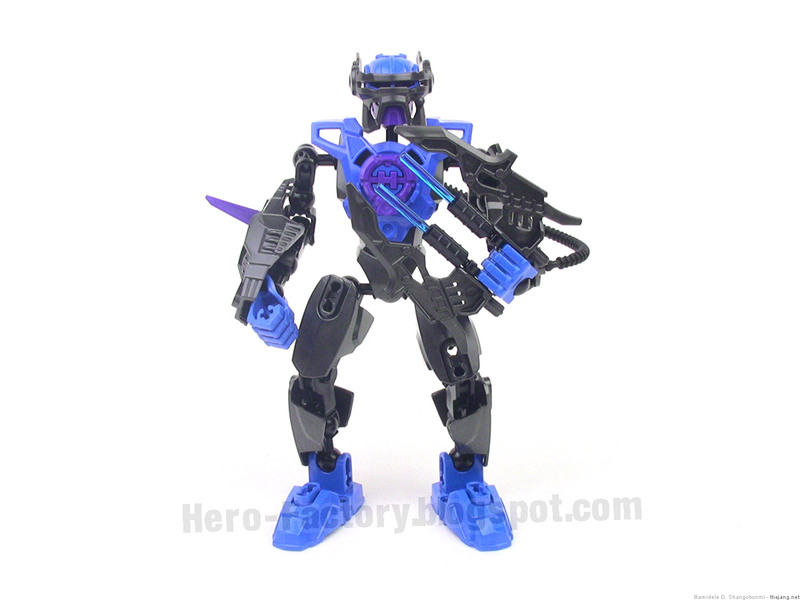 However, with Surge in particular, there is a bit of 2010 Stormer/Stringer/Bulk syndrome with the weapon. 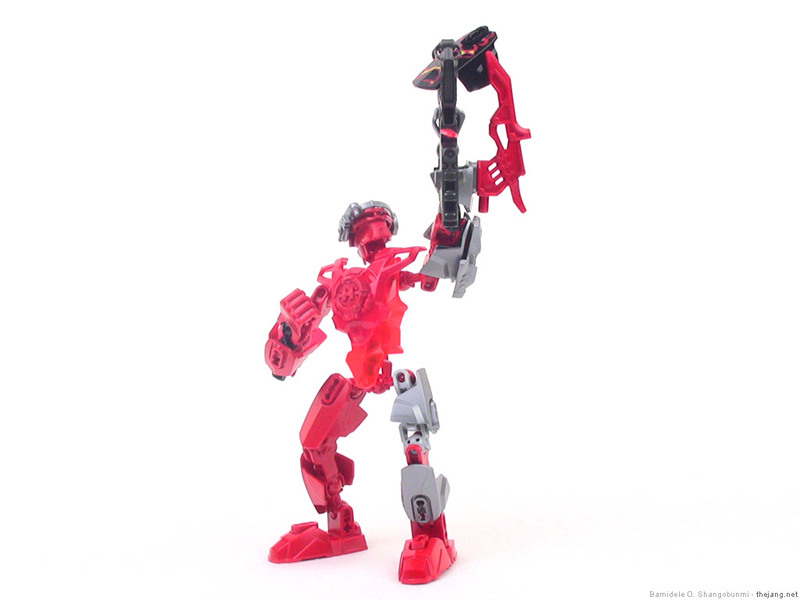 Surge 2.0 uses a two-handed weapon, but it has very limited posability when attached as indicated in the instructions. Also, the head can barely turn to face the direction the weapon is pointing, when both are aligned to one specific extreme edge of their respective ranges of motion. With the weapon in a more natural position, the head has to be tilted upwards a bit in order to be able to line up with the barrel of the blaster. 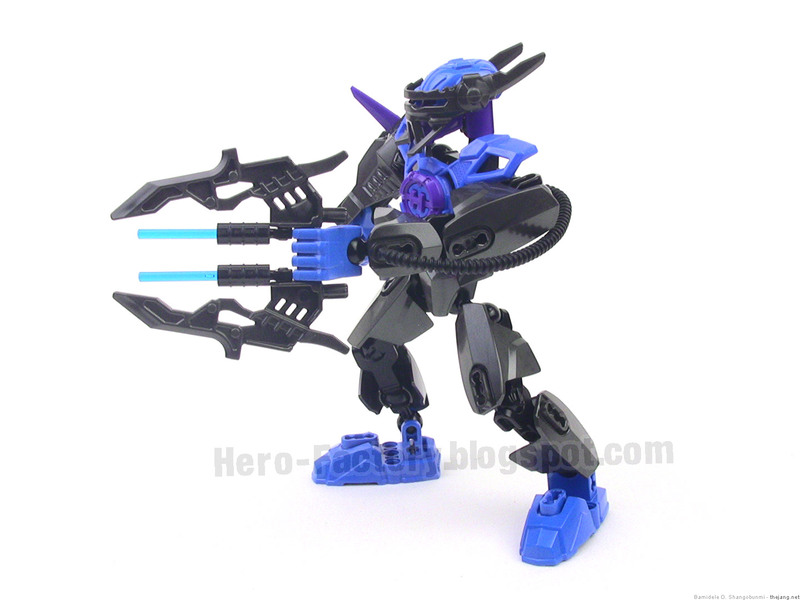 You can disconnect the left hand and wield the weapon differently, but I don't think it's excusable that Lego released yet another character that can't look where he's shooting. In all, Surge 2.0 is my least favorite hero set from the early 2011 Hero Factory release series. In the video I take a look at the new ball & socket joints and thin skeleton construction. 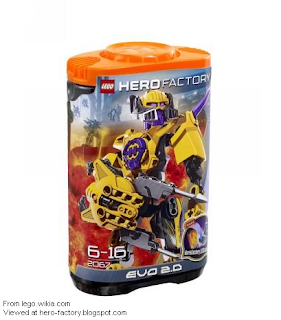 This also covers the hero armor and all-new modular head design. I like this character. 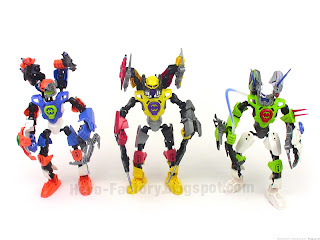 Good overall look, unusual (but good) color scheme, tons of articulation. Very well designed figure overall. 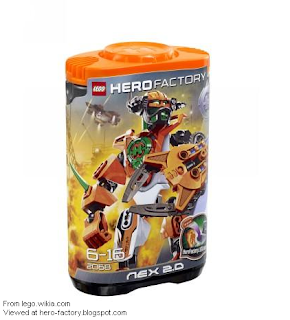 I think this may even be my favorite among the new LEGO Hero Factory heroes! Here's my video review covering the parts & build of Fire Lord, LEGO set #2235 from the early 2011 Hero Factory villains series. 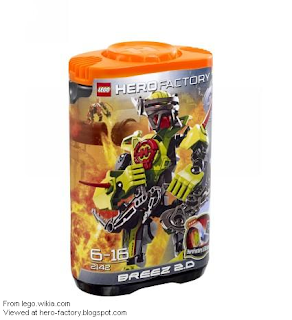 For a bigger view see the Hero Factory Fire Lord review directly on YouTube. It's a little tough to get past the new building style that's so dependent on ball joints all around. If you look beyond that or are happy with it, then Fire Lord is an okay-looking villain set except for the upper legs, which completely and utterly ruin the appearance for me. The thinness of them is disconcerting to begin with. The fact that the parts are completely exposed looks sloppy and unfinished. The fact that the main upper leg parts are also screaming bright orange, a color you don't otherwise see from the front of this set, blows me away (in a bad way). I'm also not so happy with just how many different colors and shades were included in this Fire Lord. 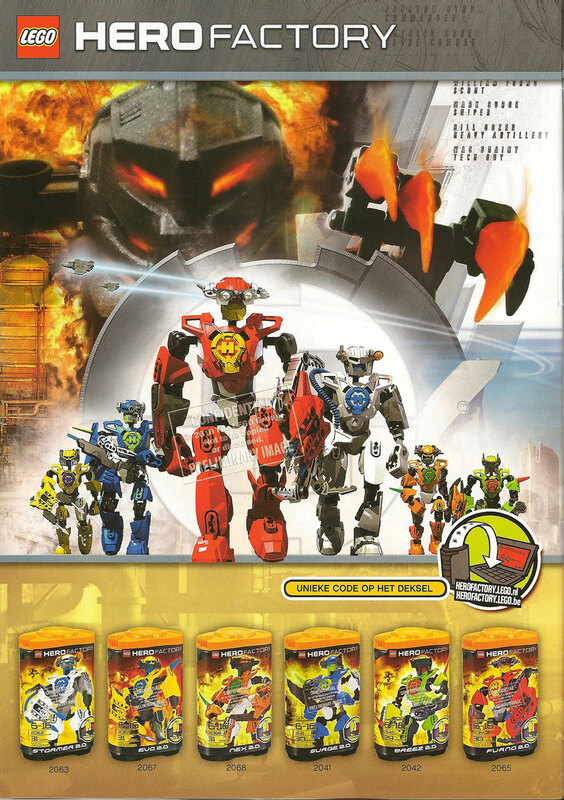 You get yellow, Furno blade orange, screaming bright orange, and bright red, including yellow/red mixes in the fire exhaust, zamor/meteor sphere, and the melting rock prints on some of the armor pieces. In the gray spectrum, you have bright silver, dark pearl gray, and black. That's a lot of colors, and they're distributed pretty evenly all around. 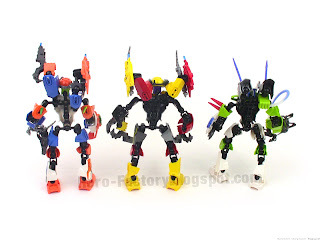 In all, the parts are very intriguing and a few of them are downright amazing, but the completed set looks like a joke, almost a really bad MOC made by someone who only has a handful of completely random parts. The feet look insultingly unfinished and nonsensical to me as well, and the side-to-side leg articulation is very limited and impractical. Sorry LEGO, I do not like this one. Lots of great parts in this set, but as a correctly-built set, it's a mess. Alright, giving this a shot! My first ever LEGO System set build & review, and it's a tiny one! Time for a change? A BIG change? 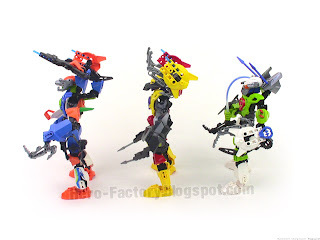 In 2010, Bionicle was discontinued, and Hero Factory was launched. I was sad for the loss of an old stalwart, but happy to see that I'd be able to use my mountain of parts towards a fresh new use with a lot of future potential. I happily adapted and hopped on the new bandwagon. 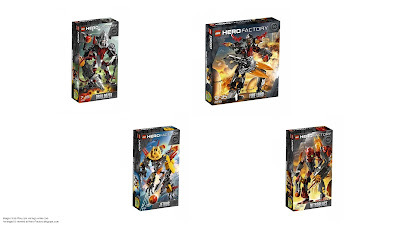 Now, it's still 2010, and second series of Hero Factory sets have been fully unveiled. 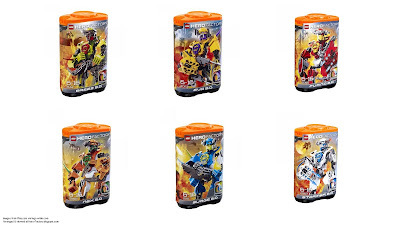 These, for better or worse, are vastly more different from even the earlier-in-the-year series than the first HF sets were from Bionicle before them. Suddenly, a great portion of my mountain of parts is looking quite lonely and behind the times. I'm not so sure I'll be adapting this time. 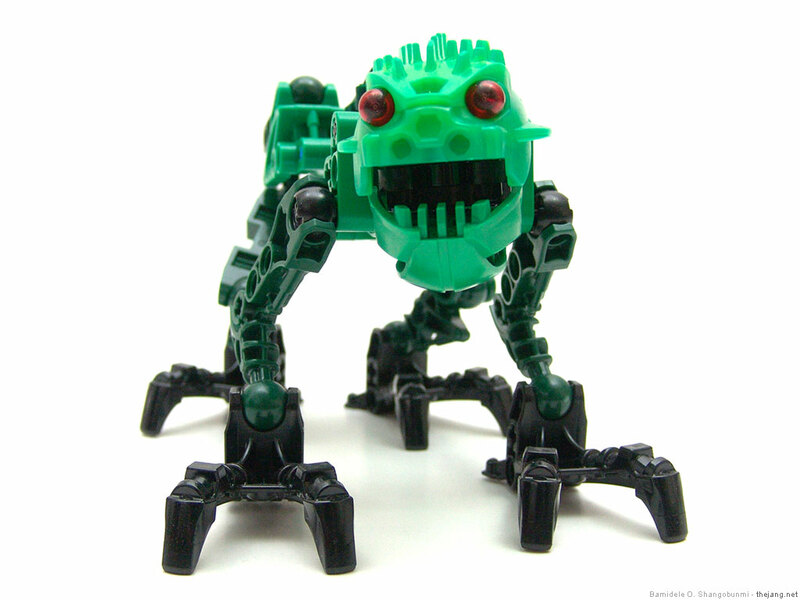 Instead, I'm very, very seriously considering making a very, very different move within the LEGO omniverse. What do you think, should I do it? Should I pull the trigger? 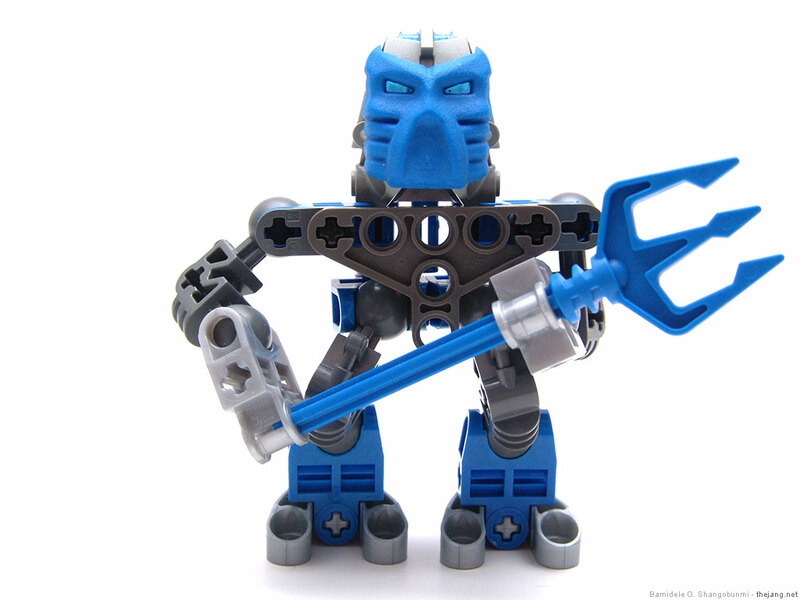 Zeyek enters the LEGO Hero Factory universe! Zeyek leaves Bionicle, joins the Hero Factory universe! Tylus is a member of the Hero Factory's low-key Target Deprecation Squad. Every now & then a foe is identified that is too dangerous to capture or too hazardous to deactivate disassemble. That's when TDS gets the assignment. Their specialty is neutralizing threats, permanently and irreparably. The inner edges of his weapon ionize when it fires, helping to focus and intensify the emitted laser beam. This dangerous tool can bore six inches (deep) per second into hardened steel, and there is not a single material Hero Factory researchers have been unable to melt through in tests. 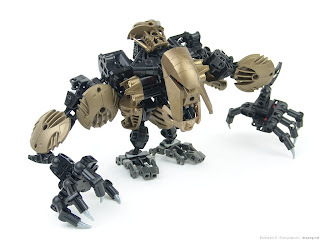 LEGO Bionicle MOC collection videos! The first thing that's important to keep in mind is that there is no guarantee (nor implication) that these are final production items that we're looking at. 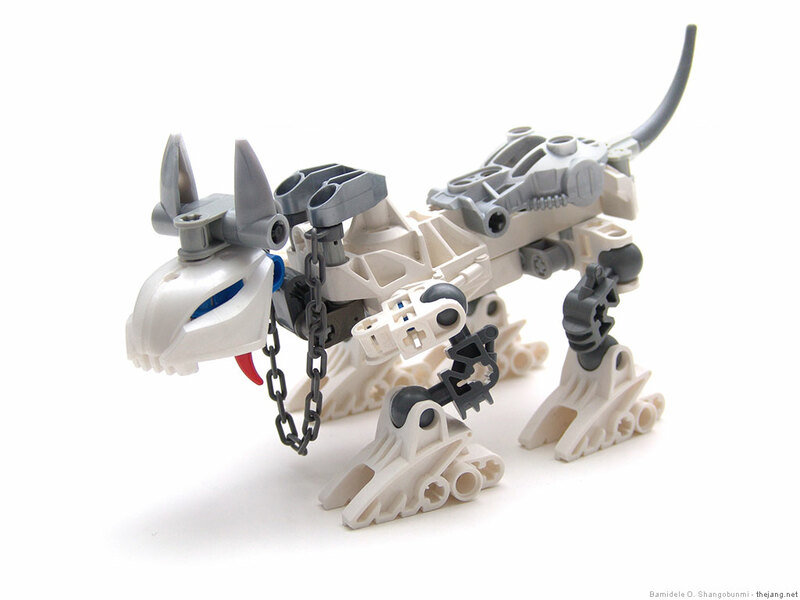 For all we know, these images could have been intentionally released by The Lego Group to stir up conversation within the community and get some useful, frank input and ideas for alterations. Then again, these may be "final draft" images, one step short of production. There's no way to know. For sake of discussion, though, I'm going to assume that these are pretty much final, and share my impressions. I'm going to start with the heroes and a bit of retrospect. I'm a heavily invested Bionicle fan, and though I was sad to see the Bionicle series come to an end, I found the new Hero Factory line to be a great follow-up, at least in concept. 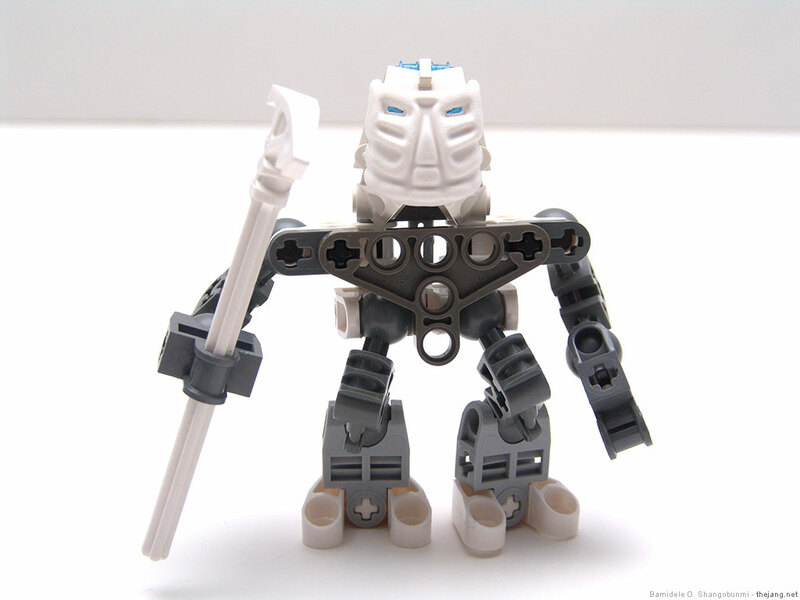 While the Bionicle universe relied on heavily-developed characters and a rigid "canon" timeline & story, Hero Factory begins with the premise that good guys are created from scratch in a factory, and bad guys can be dramatically varied and come from a limitless number of places, for a limitless number of reasons. 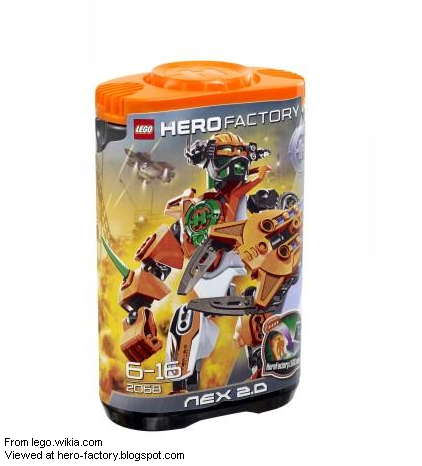 Hero Factory is designed at its core (no pun intended) to spur creativity and imagination. 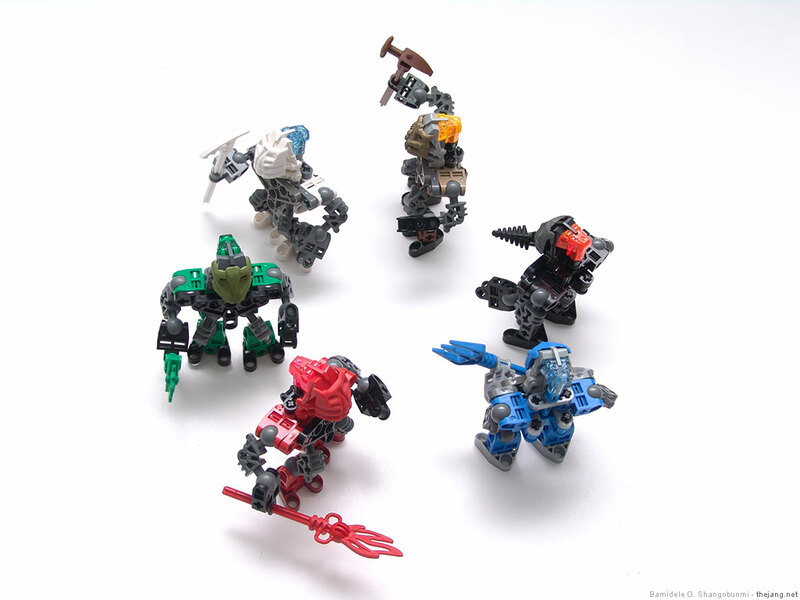 The first series of sets, though, didn't quite make good on this concept. They looked really great, in my opinion at least, but their construction was very simple, and many of the parts were too distinguished and character-specific. You can put a Stormer helmet on absolutely any MOC, and it's going to be a Stormer MOC. 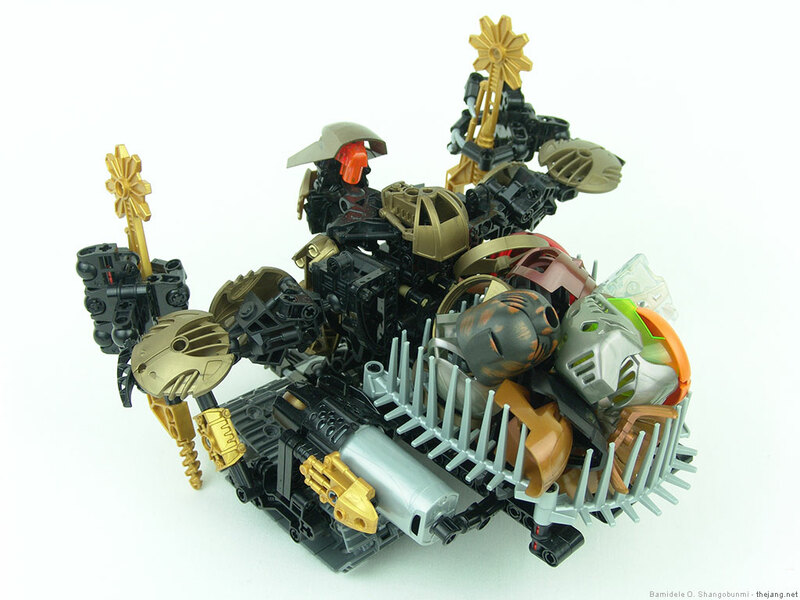 It takes a Bionicle MOC-maker with an existing stash of parts to produce a truly unique Hero Factory character. I wish they had instead set up the heroes to be extraordinarily modular, and released just a few full hero sets, accompanied by a line of "build your hero" sets with mix & match parts. With the 2011 series, it appears they've taken a gigantic step in the direction I had hoped for. Armor pieces are non-unique in shape. Arms are jointed. Weapons consist of multiple parts. Going even farther than that, Hero helmets appear to be now generic, with interchangable visors, headsets, targeting sensors & sights, etc., to distinguish the characters. I think this is a very important move for Hero Factory, farther away from the Bionicle series, but I'm not entirely happy with what I'm seeing in the pictures. 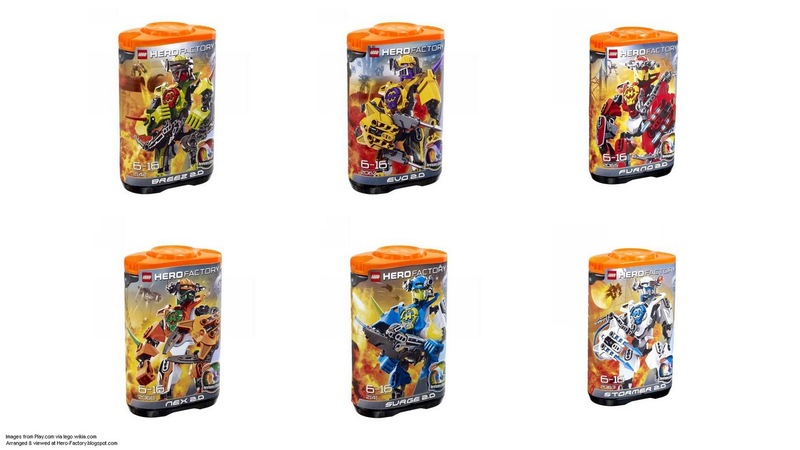 First off, when you look at all of the hero canisters lined up side by side, they all look the same, if you just ignore the colors. The head-borne accessories are too small, detailed, and subtle to make these look like distinctly different individuals. The arm & leg armor pieces have too little variation in shape. The few thorn-like pieces they add on for texture on some sets do nothing to distinguish the characters. 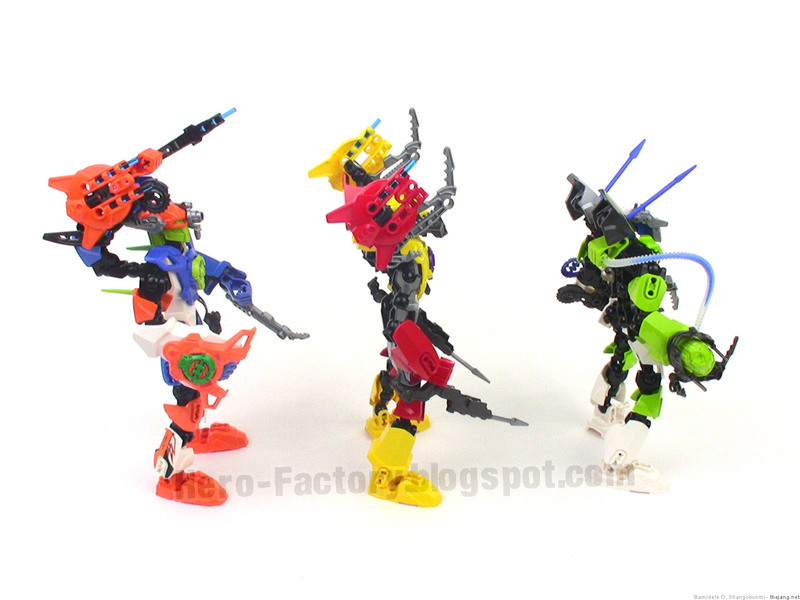 The weapons of at least Stormer, Evo, Nex, and Furno are all dominated by a common piece that makes them look too similar. I'm a bit surprised that they came up with a new hero core design, too. That's unfortunate, unless the 2010 cores will still fit. I believe the number of pieces per hero set is now perfect. The number and location of replaceable and interchangable parts is well-planned. It's the add-on parts themselves that lack variation. 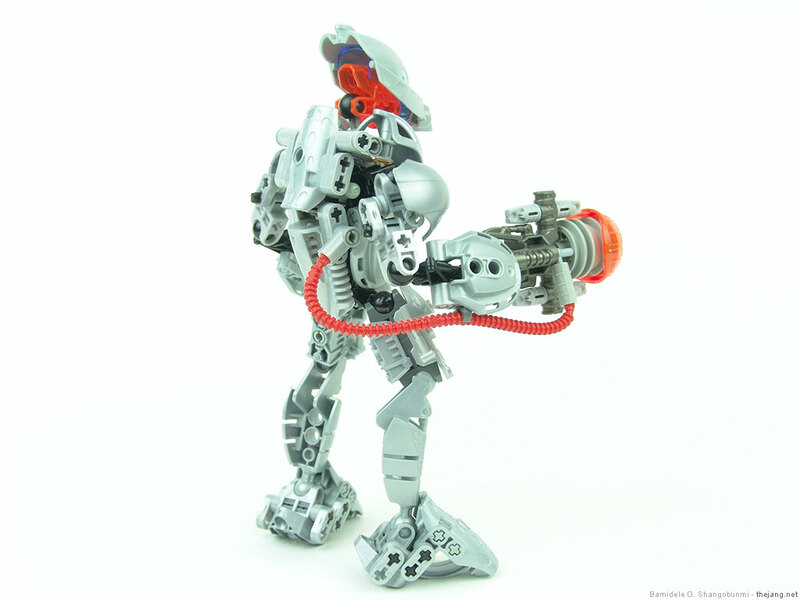 We should have spiky armor, metal plate-like armor, and smooth armor styles. These parts could be shared & mixed between different character sets with the use of different colors. Helmet accessories should be significanly bulkier and more distinct, adding more to the shape of the face, rather than just offering different eye styles as they mostly do now. 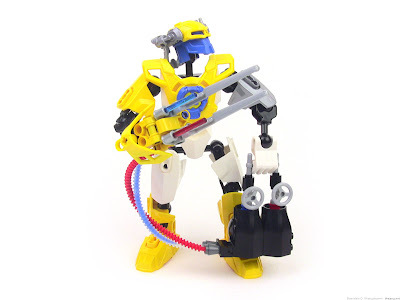 Imagine the "build a hero" set idea I mentioned above (rumor has it Lego may offer something similar, but only as an online service). Imagine the possibilities for useful, inexpensive collectibles. A weapons pack. Armor packs. Accessory packs (jet packs, skis, wheels, etc.). Each could be packaged with a different unique Hero Core. Alright, on to the villains. The 2010 Lego Hero Factory villains were good sets. Each was distinct in stature, color, power, and fighting style. In 2011 we're moving into an element-dominated series with Fire Lord and his minions. I'm okay with that. I would even be okay with a few years of this concept -- next year has chilling ice villains, the year after that has fast-moving jet-powered air villains, etc. What I'm not so happy with are the color mixes we see in this year's sets. They're using black and silver as the base colors, and that's fine. They bring in red, orange, and yellow to represent the fire element. I get that. However, these colors appear to be randomly assembled from set to set, with no continuity, no real theme. What's up with that? 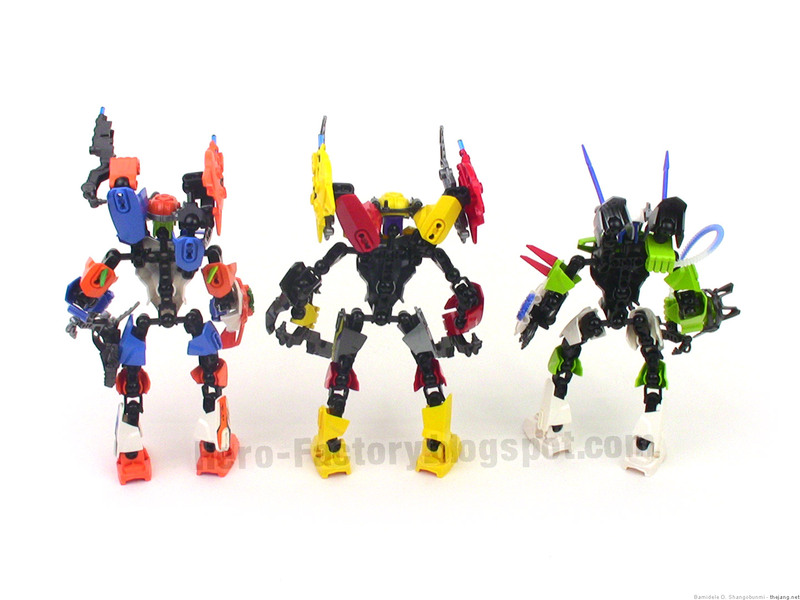 Each character looks to be made of parts from three different sets, each focusing on a different color range. 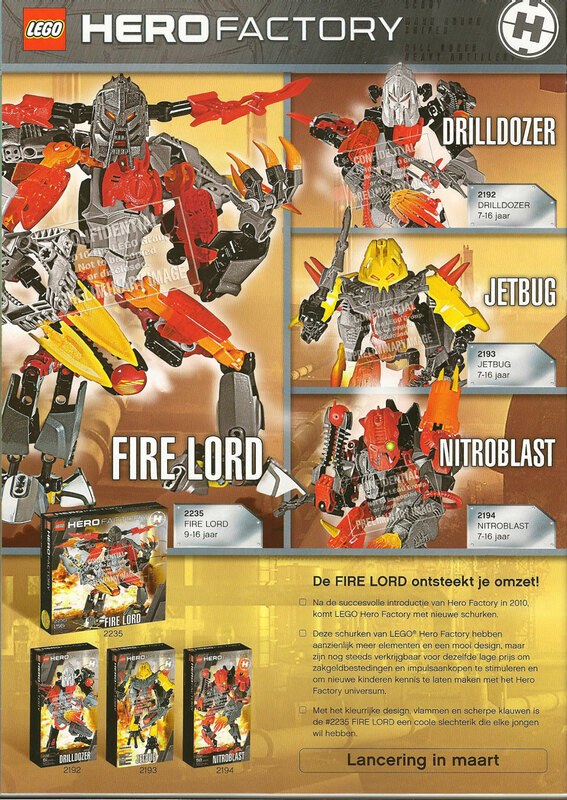 Fire Lord himself may actually be primarily a combiner, but surely the others are not, and they all need work. Overall, I think the 2011 Hero Factory series, as we've seen them so far, could use a new round of R&D. I like all of the new ideas, but the execution is not yet mature or ready for prime time. I've got my fingers crossed that the next pictures we see will kick things up to a new level of visual impact and completion. How about some forest dwellers? 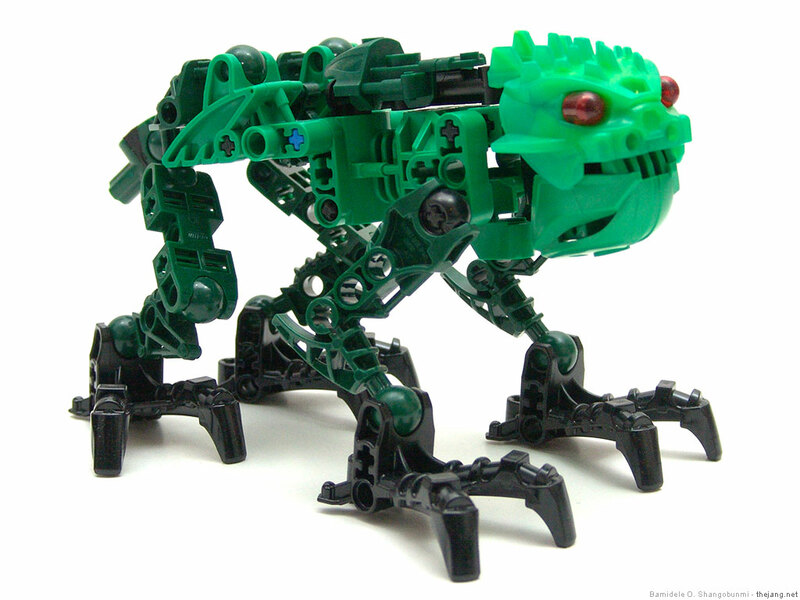 This flexible tree lizard and poisonous tree frog are common creatures that Toa Lewa grew up around. The blue & green Fikou tree spider, on the other hand, is a rare spectacle. At long last, the time has come for me to get caught up with posting my rahi MOCs! 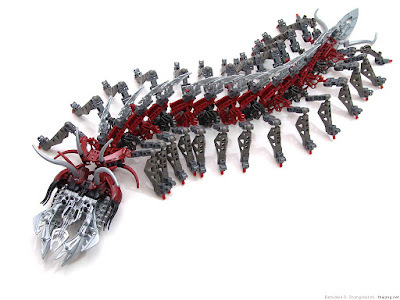 I'll start with this giant centipede. It measures 30" long and was built basically just to use up a lot of parts, since some of my parts bins were overflowing badly after a bunch of used collection purchases off eBay. Next is a dog-like rahi that came about as a result of just trying to find anything really different I could do with an Ehlek mask. Paired with a Lerahk mask for a moveable jaw, it took on a new life, and the body basically sprouted from there, creating something I think has dog-like qualities. This next, hyena-like thing has no name or story behind it. I also made this in my early days of MOC'ing. This next creature comes straight from the swamps of Karda Nui, where it wades through the deep marshland, prodding through the murky, weedy waters with its long tongue to search for sugar-rich rhizomes -- energy storage pods of certain plants. One day many, many months ago, I was going through my parts bins, sifting through various items, looking for inspiration for a new creation, and I paused to look more closely at my bag of krana. 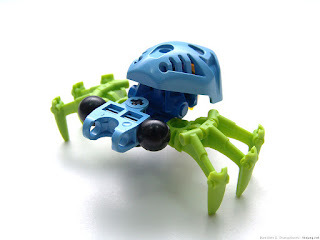 They're such cool looking things, especially when attached to a head and not just displayed in a Bohrok shell, and yet they're infrequently used. 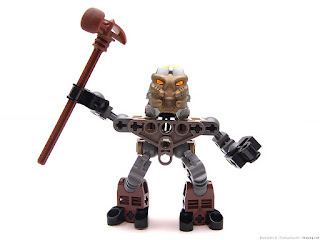 I decided to make a krana-possessed character and it it ended up being the Le-Matoran pictured above. I was pretty satisfied with how it turned out, and went about trying to come up with others. Soon I had covered all six main color schemes, and we had a party!